João, a young computer scientist spending some months as a volunteer with the Taizé brothers in Alagoinhas, writes about his experience with children in poor neighbourhoods. He has worked on the training courses which have developed alongside the activities of the "brincadeira", which the brothers have been running for many years. 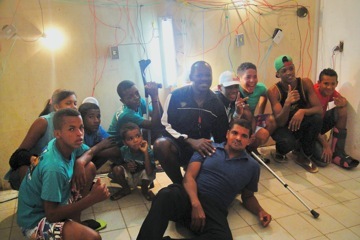 For the second time this year, there have been apprenticeship courses run for youth and young adults from the neighbourhoods around the "brincadeira". Without any advertising, more than 50 candidates came in three days and by the end of the week there were over 90. Courses were offered on hairdressing, electrical work, computer sciences at both basic and advanced levels. They are free of charge and make training accessible for young adults from city outskirts who don’t have any financial means. Living far from the city centre, other offers are out of reach because of the costs and distance. The teachers leading the courses take on the task not only of educating, but also of welcoming each person. They take into account the risky social situation in which the great majority live. Drug trafficking and use are more and more present around, coupled with a rising criminality in the neighbourhoods. The lack of family structure raises the necessity of separating them from a reality which doesn’t offer any future and to give them new hope, Consequently, efficiency in study and during the apprenticeship need to be understood in this context. There is a flexibility in discipline. Above all, each person needs accompanying individually, to be listened to, and ways need to be found to keep them there. I took care of the enrolment process and placement of students in the classes. We were especially concerned with those who had abandoned their courses the term before and who had also in some ways distanced themselves from the "brincadeira". For weeks, I took part in conversations of genuine reconciliation. Many young people came back and started to attend courses again. By the end of the year, the apprentices will be capable of putting their knowledge into practise. The hairdressers have already been trying out their techniques on each other. Mothers cut their children’s hair, sisters cut each other’s hair and often the boys arrive at the "brincadeira" with a new hairstyle. One apprentice very proudly told me that she had received a job offer. The apprentice electricians have also started to do little repair jobs around where they live. In the "New Republic" neighbourhood, the switching on of the new electrical installations done by students in a house which previously had no electricity, led to the celebration of a "Festival of Light". There is a growing sense of purpose. Youth feel valued and discover their own potential. It’s interesting to note the feeling of solidarity and good-heartedness among the apprentices. The apprenticeship is not centred on competition or rivalry. They all walk side by side, helping each other. This can be seen very clearly in the basic computer science classes that I personally look after. I’m at hand during the lessons to help out with practical things. But in fact, it’s they that help each other most of the time. The idea of self-sufficiency that is encouraged in European society holds no sway here. The harshness of life means interdependency is an obligation. My students are both interested and diligent. When the teachers arrive, all the pupils are already there waiting for the opening of the classroom. And it’s in that room that most switch on a computer for the first time. Paradoxically, easy access to cell phones has made them more familiar with the latest technology such as Facebook or WhatsApp than with a personal computer. The perseverance with which they take part in the classes from Monday to Friday has caught me somewhat by surprise. I’m quite taken aback because I’ve visited the places where they live and seen the conditions. There is nowhere quiet conducive to study, so how do they manage to feed their interest in such a persitent way? The gap between the poverty of their homes and the universe of a computer science course is really a huge gulf. And they also have to face down their fears and insecurity. The difficulties begin in class with language. Several don’t know how to write correctly and some are close to illiteracy. The simple task of typing a text is a source of shame and almost humiliation. Though this paradox is so great and really disturbed me, it also opened my eyes to see that these young people are real fighters. And that taught me to put my own fears and insecurity into perspective.